1. Change your FaceBook background picture to one of 10 Yes on 37 images now through November 6th. The correct size image is available here. This simple participation on your part will reach all the people who see your page. Your personal endorsement will speak louder than deceptive commercials that cloud the issue and confuse the general public. 2. Share these two powerful movies with your community: Both Genetic Roulette and The Future of Food are available to view for free online through November 6th. These films shed light on the dark side of GMOs and provide easy-to-understand explanations of why Americans deserve the same right as citizens in 51 other countries, to know which foods are genetically modified so they can decide for themselves. Have a screening party at your home or simply post them on your FaceBook page or send an email with the links. Again, it is your personal endorsement, info coming directly from you that will speak louder than the cloudy campaign coming from Monsanto. 3. Share a Laugh: Politics can be pretty heavy stuff. lighten it up with Danny Devito, Bill Maher and an all-star Hollywood cast as they make light of a serious subject with this entertaining video. Share the video via Facebook, through email or even via text. 4. Donate time or money: This last few days before voting on November 6th voters will be slammed with paid opposition to labeling GMOs. 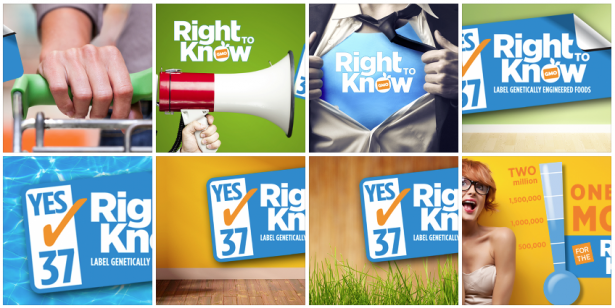 You can donate your time or money to help spread the Yes on Prop 37 message. Learn how on the Campaign Headquarters page of the CARightToKnow.org. 5. Vote with your Dollars: This is an ongoing way to stand up for your right to decide for yourself and to avoid GMOs. To a large degree, this method worked well with dairy products from cows treated rBST (recombinant bovine somatotropin -given to cows to increase milk production,released on the market with no reliable safety testing and fraught with health concerns). Even big business has to respond when the consumers said no by withholding their almighty dollars. That’s why you won’t see rBST milk at Walmart. Take the same stand against GMOs. Download the free app from the Non GMO Project to help you avoid GM products.